CROPS: Local by Atta produces a variety of lettuces, basil, kale, Swiss chard, bok choy, cilantro and microgreens. Products are sold at farmers markets, health food stores, grocery stores, restaurants and through a weekly basket program. The basket program is expected to increase sales as the company looks to expand with pick up at local businesses, municipal buildings and its new production facility. The Local by Atta team (from left to right) includes: Brandon Petitpas, assistant farmer; Jesse Howatt, co-founder and farmer; Nick Barron, assistant farmer; Julian Howatt, co-founder and farmer, and Svitlana Rastovska, assistant farmer. Local by Atta was founded by Julian and Jesse Howatt. The two brothers, who grew up on a farm, have professional backgrounds in urban planning. Julian said one of the reasons that they chose to do indoor hydroponics was the limitations of an outdoor urban farm. “With an outdoor urban farm there are limitations with the land that is available and it is more difficult to do very intensive farming,” he said. “Also, our climate is not conducive to long growing seasons because of the short summers. 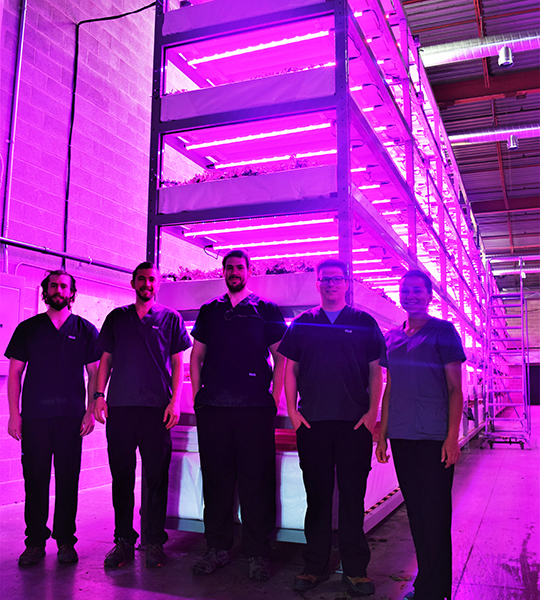 When the Howatts started growing hydroponically in their backyard shed they were looking to trial a couple of LED lights. In late 2013 the Howatts began growing in a commercial building renting 1,500 square feet of space. “We started off with a nutrient film technique system with PVC channels,” Julian said. “We figured out very quickly that the plumbing for this type of system is much more complex resulting in more issues including leaks, flooding and clogging. We eventually switched over to a raft system. When the Howatts moved into the building they had limited funds to set up the production facility. A fire in January 2016 destroyed the interior of the building including $10,000 worth of crops that had just been planted. The company’s new location consists of 7,000 square feet with 1,000 square feet of that space used for office, storage and cold storage. “Our set up is basically a big rectangular space,” Julian said. “We have the space for six large towers. We have the frames built and are currently using three of them. Each tower measures 16 feet tall, 50 feet long and 4½ feet wide and has six production levels. Each level has two ponds measuring 4- by 24-feet. As we expand we are filling in the frames with the ponds, rafts, plumbing, lighting and wiring. The water reservoir is at the bottom of the tower and the water is pumped up to each level and then drains down to the bottom. For the new facility the Howatts chose GE LEDs which they have been using since January 2017. “After the fire we began looking at rebuilding and we only considered installing LEDs,” said Julian. “We didn’t even consider fluorescents. It was mostly because of power constraints. The fluorescent lamps were consuming too much power and generating too much heat. It wasn’t feasible to add more fluorescents. Local by Atta produces a variety of lettuces, basil, kale, Swiss chard, bok choy, cilantro and microgreens. Products are sold at farmers markets, health food stores, grocery stores, restaurants and through a weekly basket program. Julian said one of the advantages of using the GE LEDs is their energy efficiency. “The biggest constraint for us besides money is the power constraint,” he said. “How much power do we have access to in the building can be an issue. It’s not as simple as just getting more power from the utility company. For more: Local by Atta, (506) 233-0393; moncton@atta.ca; http://www.atta.ca; https://www.facebook.com/LocalByAtta. Click here for additional Case Studies and Horti-Facts.